This is a fine collection of Rhythm & Blues and Soul which the fourth LP may well have sounded like, if Guy Stevens had issued it back in the 60's. 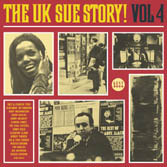 Vintage Sue records and all that information on each track! Stand out tracks are for me, Joe Haywood and his original version of Warm And Tender Love. Pure Stax's Soul from Danny White with I'm Dedicating My Life. The haunting Soul 66 LP track Love Call from Gladys Knight and The Pips. R&B from Ike & Tina Turner, Jimmy Reed & Elmore James. Goin' Home by Roscoe Gordon from an Island records issue just about sums up this compilation by Tony Rounce and Mike Atherton. There is still plenty more in the Sue catalogue, can those tracks that have not be issued on CD be licensed, probable not. Issued by Ace on Kent CDKEND 258.